Mrs Carlile told me that she had bought me a new tank that was bigger and better than my last one. Since it was the 1st April, I thought she was trying to play a joke on me...but I was wrong. It is true. I have a fantastic new big tank to play in. Mrs Carlile tried to take lots of photos of it but since I was feeling a little bit mischievous, I though I would photo bomb all the pictures. See if you can spot me! I'm such a funny snail! Finn, Freddie and Fifi came to join me in Year 2 whilst the building work was being completed in Year 3. They are very well behaved fish. But look who they brought with them! Matty the Macaw! Look what he got up to when he thought that no-one was looking...he tried to eat me! 2nd April 2014 - Look who was waiting at the window to visit me this morning. Cecil the garden snail. He was on his holidays so he thought he'd call in and visit me. Matty the Macaw has told me he is very sorry for trying to eat me and has been to the forgiveness tree to pray. He then helped Mrs Carlile do some jobs such as marking books, reading his favourite book, Shroud of Sorrow by Tommy Donbavand, feeding the fish, getting some clean water for the fish, looking at some of the displays in Year 2, doing some sums (I don't think Mrs Carlile realised that the answer to his sum wasn't yummy...it should have been = 2 snails! ), counting Harry's bucketful of dinosaurs, learning his times tables and flying off to the moon in a rocket... grrrrrrrrrrr......pity he had to come back! Apparently Matty the Macaw thought he would show me how kind he really is so he flew to Tesco to get me a bag of lettuce. That was very kind of him but I still don't trust him. He nearly did a 'Mrs Carlile' as he picked up my old lettuce leaf to throw in the bin and I was still attached to it! Flying snails...again! He did put me back gently and gave me some new lettuce. However, when Mrs Carlile wasn't looking, he climbed into my tank! I managed to hide under my lettuce but I wish the builders would hurry up next door so that Matty the Macaw can fly back to his own class room and leave me alone! He scares me! ...and then he decided to feed the fish but tried to eat them as well! Matty the Macaw trying really hard to get to me! Miss. Hartley has bought Finn, Fifi and Freddie a new tank. It is very posh and will look lovely in her new room after the holidays. Guess who is jealous and has now taken to sitting on top of it, staring at the fish? Yes, that's right...Matty the Macaw. He keeps annoying them by flicking their new light on and off all the time. Go away Matty! GOOD NEWS...We will be getting some more new members of Year 2 soon. I overheard Mrs Carlile and Mrs McKeating talking about Mr McKeating fishing something out of their pond for our classroom. Can you guess what it might be? I'm very excited as I might need to be a midwife (midsnail) again! Yippee. Meet Senor Froggie...I think he is going to be in charge of the new recruits. I am hiding from Matty the Macaw. It took Mrs Carlile half an hour to find me so it should take Matty longer if he manages to open my lid. No-one expects a snail to climb up a plastic plant and hide there...so that is what I did! Mr Carlile called in to see me later this afternoon and to check that Mrs Carlile had been feeding me during the holidays. He was very pleased to see my new tank and he had a word with Matty the Macaw to let him know that he must stop pestering me and the fish. Matty didn't look very happy about that at all! Matty the Macaw has finally flown back to his nest in Year 3. I am very glad to see him go but I will miss Finn, Fifi and Freddie. They made me laugh as they were always trying to teach Fidget new tricks. Matty has a brand new classroom now so I am hoping he will be happy there and stop coming to see me in Year 2. Can you tell that I still don't trust him very much! Look how posh I am. Mrs Carlile has got rid of my table and has put me higher up on a set of drawers. She has given me the responsibility of guarding the resources in them. Wow! I love it when I'm trusted to do a job and be responsible. Just call me Stanley the Responsible Snail Wilbur Hufflepuff! I can't wait to see all my friends in Year 2 this morning when they come back to school after the 2 week holiday. I wonder if they have missed me? I was so excited, I decided to climb to the top of my lettuce in my tank so that I can get a better view of my friends when they arrive. I hope I don't fall off! Wow...the first day back from the holidays and all my friends were back to see me. I have missed everyone. I have had an extra special friend who stayed with me today. He is called Brian and he is a garden snail. He belongs to Grace who brought him in to see me. We all had a good look at his shell. I must admit, his shell has a nicer pattern on than mine! He really was a handsome chap. I hope he comes to visit me again soon. Congratulations to Burnley Football Club. They were promoted to the Premier League yesterday after a tense game against Wigan. Well done Burnley, you have played well and have played fair all season. You deserve your promotion. You will never guess who came to see me today? Mrs Thomas and Mr Shutt, our visitors from Ofsted. I think that Mrs Thomas liked me as she even shook my hand when she met me! I felt very special. Mrs Carlile told me that Mrs Thomas mentioned in front of the whole staff that she had already met the most important person in the school. Can you guess who that is? I'm so excited I can hardly breathe! How special do I feel now? I hope you are both enjoying your visit and that you have heard great things about our school. I love St. John's school. Everybody looks after me so well. You only have to read back in my diary to see how loved I am here. Please come and see me before you go tomorrow. Hayden has sent me a photo of a snail he met! 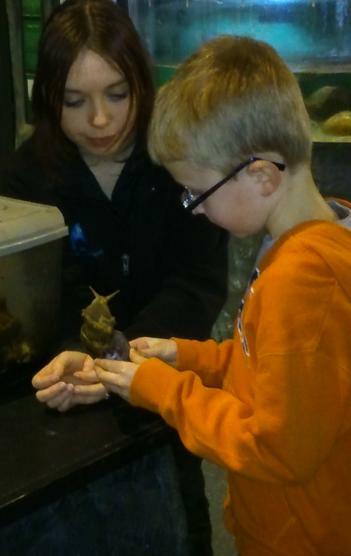 He also brought two snails into school to meet me that he had met in his garden. He hasn't named them yet. I can't wait to find out what they are called. You'll never guess what has happened to me! I have had a parcel sent to me, Stanley Hufflepuff, through the post. Can you believe that? How important did I feel. It was a lovely set of books for my friends in Year 2 and a fantastic letter from a man called David Dovey. He wrote the letter telling me all about his snails who are also Giant African Land Snails and why he had sent the children in Year 2 some books. Mr Dovey (David) is from TARGET WHO who kindly donated all the Doctor Who books to our school library and who is still sending books up and down the country. He must be very proud of what he has achieved. Mr Dovey, my friends and I are currently writing back to you to say thank you so keep your eye on the postman later this week or early next week. This is Mr Dovey visiting his old primary school when he donated some Doctor Who books to their school library. It is nice to put a name to a face. I bet he doesn't know what I look like. I think I might need the children to draw me and send him some pictures! I'm very excited this morning. This afternoon, Mrs Carlile is taking me to visit all the lovely children in Reception. As part of their science topic, they are looking at mini beasts and they don't come much more mini than me! I don't seem to be growing very much at the moment, but I am strong and healthy. Mrs Carlile says I'm small but perfect. I agree. I was ready and waiting to go to Reception at 6.45am this morning...on my roof waiting to go! These are the photos from when I went to visit my new friends in reception. They asked Mrs Carlile some super questions about me.